Tell Us Where Do You Want To Go? | What is the real name of this hotel? 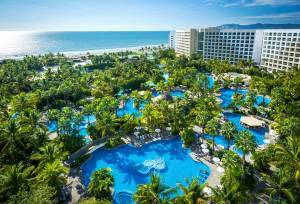 This Ultra Luxury Nuevo Vallarta Resort is a winner of AAA`s coveted 4-Diamond Award for outstanding accommodations, amenities, and service. This amazing Pacific Oceanfront hideaway offers spectacular views of the Sierra Madre Mountains. 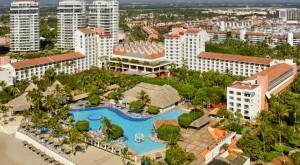 The resort is located only 15 minutes from the international airport (PVR) in the Nuevo Vallarta area. Unlimited luxury is a new and better way to have it all! 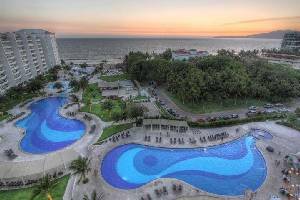 The Ultra Luxury Nuevo Vallarta Resort provides a high level of luxury and ambiance for couples, friends, and families in breathtaking and unparalleled tropical settings. Enjoy unlimited gourmet dining at the five internationally themed restaurants at the Ultra Luxury Nuevo Vallarta Resort, with no reservations required. Choose from Italian/Mediterranean Portofino, the ocean-view Seaside Grill, the Mexican restaurant El Patio, the open-air seafood Oceana, and World Cafe, a breakfast, lunch and dinner buffet. Five bars add to the fun. 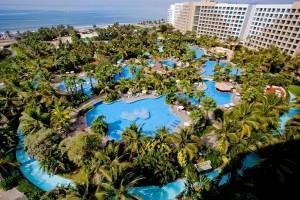 The Grand Mayan is our most popular resort hotel, attracting families from around the world year after year. By channeling the rich history of Mexico and reimagining it into a world of wonders, we've created a unique experience that transcends the typical and redefines resort vacationing. Las Palmas by The Sea features comfortable accommodations and modern facilities. The friendly atmosphere, fine accommodations and affordable prices, make this hotel, the ideal place for your next family vacation or romantic honeymoon. The city of Puerto Vallarta is famous for its lovely surroundings, stunning views of the ocean and friendly people. Explore all the beautiful spots the city has to offer, such as, the historic center, the handicrafts market and the lovely colonial cathedral. Enjoy wonderful and conveniently located facilities,including a panoramic Jacuzzi, two swimming pools, sports bar and massage center. You will enjoy a pleasant and fun vacation in this lovely city, famous for its year round good weather. Las Palmas by The Sea is the perfect place to spend a memorable vacation. At Las Palmas by the Sea enjoy your vacation at the seashore where an enthusiastic team offers a variety of activities. Scuba diving classes for beginners. Immerse yourself in an atmosphere of tranquility and sensations that allow your body and mind to enter a state of peace and harmony. Las Palmas by the Sea offers you our massage clinic where you will find services such as relaxing massages, anti-stress massages, reflexology, aromatherapy, pedicure, manicure, and more. This 5-star rated, oceanfront resort is situated in Nuevo Vallarta, nestled along Bahia de Banderas, one of the worlds largest natural bays, with the Sierra Madre Mountains as a backdrop. Just ten minutes from the Puerto Vallarta International Airport and just 25 minutes north of Puerto Vallarta, there are many great attractions nearby, including Vallarta Adventures, Aquaventuras Park Vallarta, Marina Golf Club and El Faro Lighthouse. Plus, the hotel is set alongside championship, 18-hole golf course with Jack Nicklaus Academy facilities and pro shop. Discover Bay of Puerto Vallarta, a tropical sanctuary on the sands of beautiful Banderas Bay. With romantic views of the ocean, you'll be spellbound by its luxuriance. Overlooking Marina Vallarta, in one of the most exclusive and serene neighborhoods in Puerto Vallarta, four stars of luxury after a 5 minute ride from the airport or 10 minutes to the town center. Where is Puerto Vallarta? 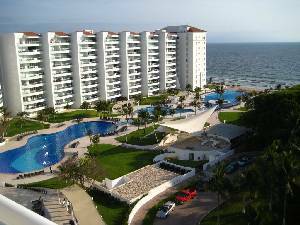 Located on Mexico's beautiful Pacific coast, with an international airport and seaport making it one of Mexico's most popular vacation destinations. Waterfront Gazebos, The Perfect Spot For Picture Perfect Sunsets Overlooking Puerto Vallarta. A Chip Shot Walk To The 18 Hole/ 72 Par Marina Vallarta Golf Club. Live Nightly Themed Dance Shows, From Retro To Traditional Cultural Dances, Performed By The Hotel's Own Private Dancers. 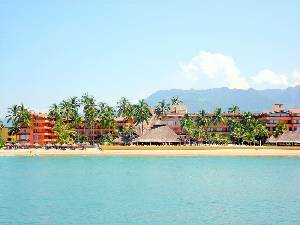 In Nuevo Vallarta situated alongside a secluded 12-mile stretch of one of Bahia de Banderas most picturesque beaches. 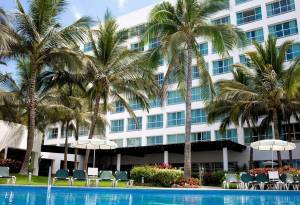 Just 15 minutes from Puerto Vallarta international airport and 25 minutes from downtown. 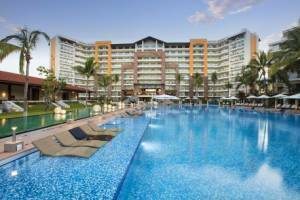 Samba Vallarta All Inclusive is a dazzling resort located oceanfront in the exciting Riviera Nayarit. The hotel is set in a peaceful tropical oasis of exceptional natural beauty. Built in a contemporary Mexican style, the grounds evoke the elegance and majesty of the colonial era haciendas found throughout the country. Enjoy upscale accommodations and a wide range of amenities for the whole family. 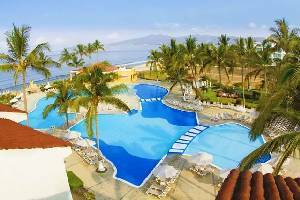 Sea Garden Nuevo Vallarta is an intimate resort hotel where guests spend their days relaxing or playing in the private pool overlooking the Bay of Banderas, strolling through tropical gardens and waterfalls, and enjoying the surrounding towns and beach activities. Sea Garden guests can enjoy all the restaurants, bars, and activities of the larger resort, as well as access to an amazing array of spa treatments at Brio Spa & Fitness Center. Located just 15 minutes from Puerto Vallarta International Airport, will offer adults an unlimited luxury escape on the golden beaches of the Banderas Bay. This all suite, most with ocean views, resort provides guests with a wealth of amenities ranging from 24 hour room service to premium brand beverages and gourmet dining without reservations to daily activities. Ideally situated just minutes from the vibrant downtown Puerto Vallarta, guests will find an array of attractions including the famous El Malecon, a mile long oceanfront boardwalk lined with shops, restaurants and bars.